Training wheels don’t work: Balance bikes teach children how to ride. They train kids how not to ride a bike! Why balance bikes are better. Gentle reader, let your mind wander back to the day you first learned how to ride a bike. Who can forget such a magnificent moment? It’s an iconic scene: The child is nervous on his shiny new Schwinn, but he trusts his father—and his training wheels. On the sun-dappled day they are finally removed, the child is confident that his training wheels have prepared him to ride a bike—that they have trained him. 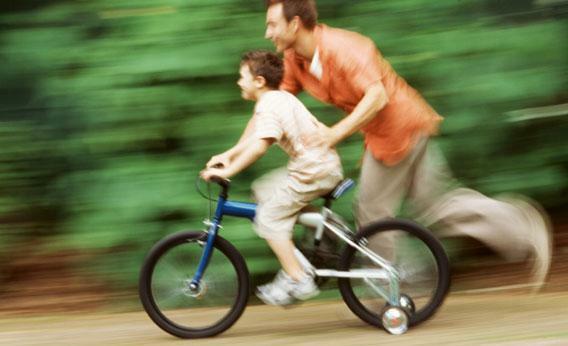 His father runs beside the bicycle, holding onto the seat, and then lets go. The child triumphantly sails forth—face down, into the pavement. Compared to the rub-some-dirt-on-it old-timeyness of training wheels, balance bikes—those wooden, pedalless bikes you’ve definitely seen if you live in Portland or Brooklyn, and you’ve maybe seen if you live somewhere else—look like a newfangled waste of money, a meta-bike, a parody of the kinds of crap consumer-culture parents will buy. (They will buy a bike that literally doesn’t work!) But the balance bike isn’t newfangled at all. It is a direct descendant of the first proto-bicycle. And its popularity is growing for very good reason: It corrects the tragic historical error of training wheels. It’s unclear when training wheels became popular, although historians suggest the early 1900s seem most likely. But it’s apparent why they became popular. They were an obvious solution to an obvious problem: How do you convince someone to climb onto something that is obviously going to fall over? To make matters worse, in order to ride a bike, you have to be willing to embrace its precariousness. As Archibald Sharp, an English engineer, wrote in a seminal book on bicycling in 1896, “If the bicycle and rider be at rest, the position is thus one of unstable equilibrium, and no amount of gymnastic dexterity will enable the position to be maintained for more than a few seconds.” To lose your nerve is to lose your balance. The impulse to solve this problem by adding extra wheels predates training wheels. “No sooner was a practicable bicycle made than attention was turned to the three-wheeler as being the safer of the two machines,” Sharpe noted. In the 1880s, there were tricycles that look like today’s bicycles—except instead of a having a single back wheel, they have a pair of wheels, evenly spaced. The problem, as the early innovators learned, was that the extra wheel made matters worse. Any kid who’s tried to corner on a tricycle or training wheels knows this. To learn to bike, you must solve two problems: the pedaling problem and the balance problem. Training wheels only solve the pedaling problem—that is, the easy one. Learning to balance on a bike is much more difficult, and a “training” tool that eliminates the need to balance is worse than beside the point. Training wheels only train you to ride a bike with training wheels. It’s no wonder your first experience riding a bike with no training wheels was terrifying! You’d never done anything like it before. Wilson’s advice wasn’t new. A century before, young bicyclists were being told the same thing: “Another plan that may be adopted with advantage, is to remove the pedals and place the saddle so low that the feet can easily reach the ground, and then push the machine along in the way the old hobby-horse was propelled, taking care to begin on a level surface.” Do this and you have made a balance bike. 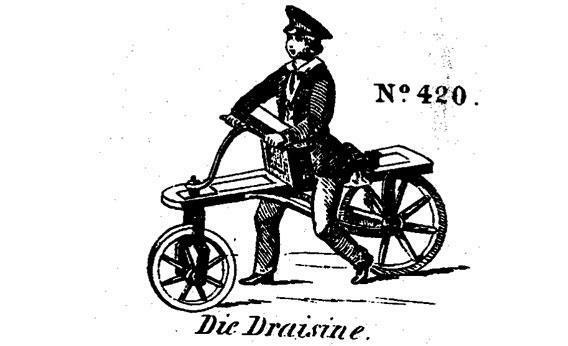 But you have also made the first proto-bicycle: the Draisine. In the beginning, there was Mount Tambora. (Stay with me.) When the Indonesian volcano exploded in April 1816, it blew ash into the outer atmosphere, altering the weather worldwide for months. Harvests failed across Europe; 1816 would be known as the Year Without a Summer. As the price of oats for horses soared, the mind of a young German baron named Karl Drais turned to the idea of a mechanical horse. His Draisine was a wooden contraption with no pedals or chain. Instead, the rider would walk along the ground and push himself forward, moving faster than a pedestrian could. The invention swiftly spread across Europe and the Atlantic, inspiring numerous knock-offs. But the novelty wore off within a couple of years: The roads were too rough; the ride was exhausting; there were accidents. The bicycle historian David Herlihy has written that early riders of the Draisine soon discovered that “every journey cost a pair of boots.” Drais died in poverty. 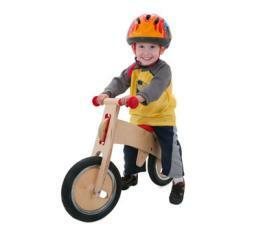 To a remarkable degree, the modern balance bike is a copy of the Draisine. Both are made mostly of wood (although not all balance bikes are). Draisine riders leaned forward against a board, not unlike the way children do today, pushed off the ground and sped away. Today, it is easy to see a bicycle in a balance bike. In 1816, no one could: The bicycle wouldn’t achieve anything close to its modern form for decades. Children who hop off a balance bike and onto a bicycle are taking a half-century shortcut. There are more and more parents who are taking that shortcut. The San Francisco Bicycle Coalition runs a popular event that’s explicitly about junking the training wheels. (They also have a good handout about how to do so.) Balance bike models are proliferating and, according to bicycle dealers, sales are rising. And they should. Children learning to ride on a balance bike solve the balancing problem first. And they solve it easily: Kids on balance bikes are faster and steadier than the contraptions would seem to permit. (Yield the sidewalk.) They have the same confidence as a child on training wheels, but the confidence is justified: They actually do know how to balance themselves on a bicycle. Once on a real bicycle, these kids only have to learn how to make the pedals work. Learning to pedal while balancing is still tricky, of course, but it is far simpler than learning to balance while pedaling. So skip the training wheels and get rid of the pedals instead. The longstanding popularity of training wheels is a historical headache; no one knows why anyone ever thought they’d be good at what they’re meant to do. Instead, they are a paradigmatic case of a learning tool that teaches the wrong lesson. Once they disappear, only the makers of Band-Aids will feel the pain. Previously in Slate, Nicholas Day said that you should let your preschoolers cook dinner with you, and explained why his son would not be wearing a sledding helmet. See all of Slate’s coverage of family and parenting.